You’ve got questions and We've got answers! 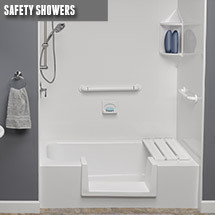 Why install a Liberty Home Solution’s acrylic walk-in shower, bathtub shower combo, bathtub, safety bathtub or safety shower? 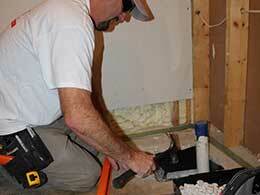 DIY is a very popular aspect of home ownership both in Springfield Missouri and the rest of our country. 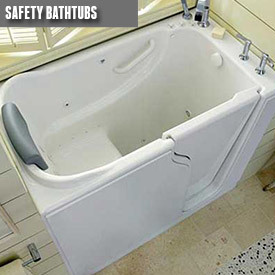 However, removing and installing a new bathtub or shower yourself is a time-consuming and difficult process. 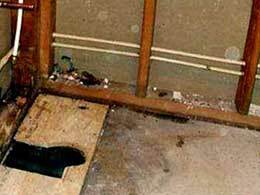 This process if done incorrectly can cause significant damage to flooring, walls, plumbing and even electrical. 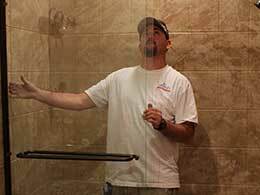 When you hire Liberty, we will install a beautiful new solid acrylic bathroom system usually in a couple of days. The Advantage of Hiring Liberty? A bathroom remodel will require multiple skill sets. 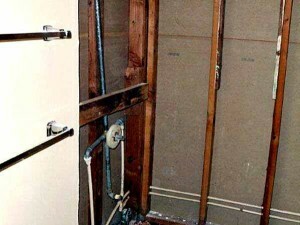 The first thing that Liberty Home Solutions does is the demolition of your bathroom. 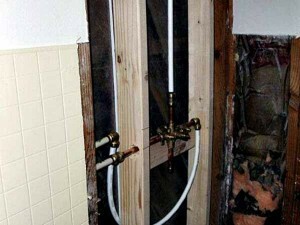 While other bathroom remodel companies will paint, refinish or overlay your existing surface, this is not a true remodel. 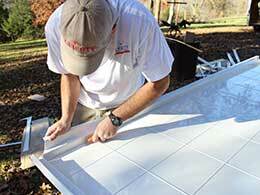 Please tab through this section to learn more about our acrylic bathroom remodel process. 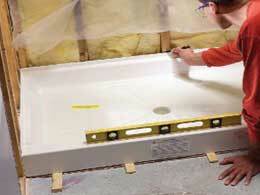 We tear the tub or shower base out of the bathroom, along with the wall surrounds. 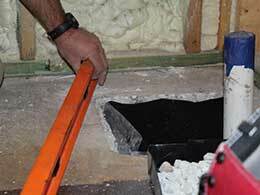 This exposes the framing materials; sub floor, stud wall and insulation to the exterior of the home. 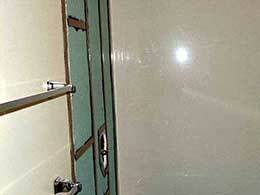 Often, tile showers or tile wall surrounds develop cracks in the grout lines. Allowing water to slowly creep behind the tile and eventually start damaging the material behind. 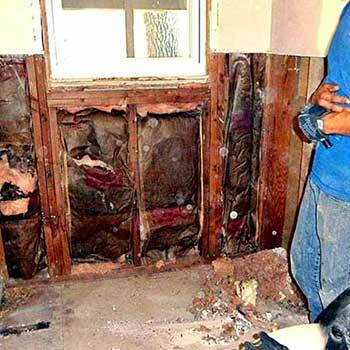 The water leaks will develop harmful mold and will rot any wood, studs or sub-floor. After the bathroom demo what we’re left with is the subfloor and an open stud wall. 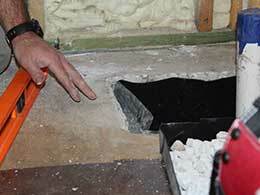 Our installers inspect all the existing material for any rot, mold or other sings of damage, including termite damage. If the subfloor’s floor’s floor’s rotten underneath, we’ll cut it out and put new ¾ inch subfloor in so that we end up with it strong, solid sub floor to work on. If there’s mold under there we spray Microban. Microban is a safe non-toxic mold, bacteria killer that’s amazing. 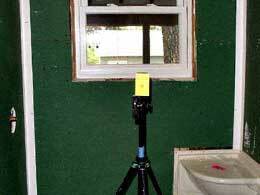 It will kill mold so it will not continue growing behind your new acrylic bathroom system. BATHROOM PLUMBING, START OUT NEW! After the sub floor and stud walls have been inspected and repaired we, then move to the plumbing. 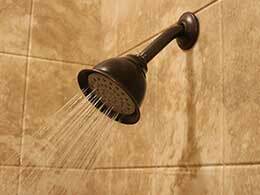 When it comes to your bathroom, many times your pipes are old, and they do not last forever. Liberty will replace the old pipes and fit the new drain. 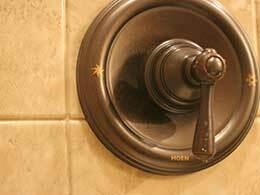 We use Moen’s values and whatever kind of plumbing material your new bathroom will require. 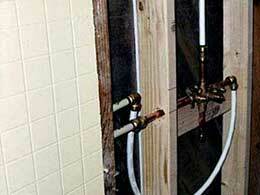 Whether it is copper or plastic, to plumb the valves, the showerhead and whatever else might be in there. When you hire Liberty to remodel your bathroom, you start out with new pipes, and valves installed the right way giving our customer’s peace of mind that they have nothing to worry about behind the bathroom walls. Once the plumbing has been completed the first thing we do is to install the shower base or bathtub. 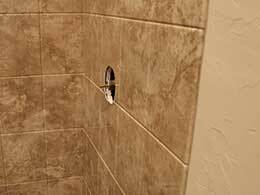 On our walk-in showers, we cut the front edge to fit, so that if your floor is out of level, it will still be perfectly sound on the floor. Our shower bases have a layer of hard foam sprayed on the bottom so when you step on our shower base you weight transfers to the sub floor. 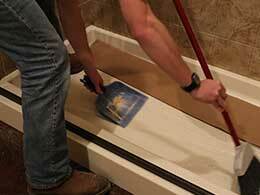 Our shower bases, unlike fiberglass bases, are not hollow underneath. 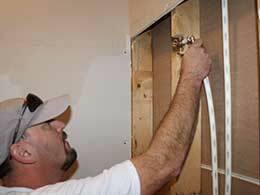 Lastly, we secure the shower base into the perimeter of the stud wall. 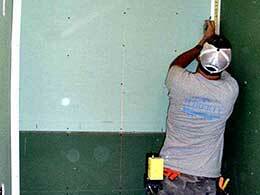 Next we install greenboard on the stud walls. 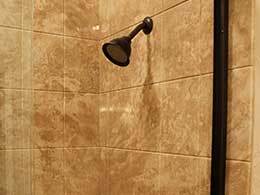 Greenboard is a water-resistant wall board, which will go on three sides of a shower or four depending on what kind of shower we are installing. This is secured to the stud walls using fastening screws. Then we go back up with what they call greenboard, which is water resistant wall board, around the three sides of the shower or four; depending on what kind of shower it is. That is all screwed on. Next we install the acrylic wall system. The acrylic wall system starts out with an inside corner piece made of acrylic that fits into the corner where the greenboard is before anything else goes on. The wall is primed in strips with Butyl primer onto the wallboard. Then a Butyl flexible tape is applied. Sealant is put in between allowing the new acrylic wall to adhere to the greenboard. When we apply the acrylic walls of the bathroom, they are there for good. There is no adjusting or moving them; thus, it is extremely important to have an expert installer, or we would have to be paying for new materials. No matter how much hot or cold-temperate changes you’re bathroom endures, our acrylic bathroom walls will never come loose. Our bathroom walls are installed with what is called “triple sealed.” There are three seals before water ever be able to reach the greenboard. Giving us the ability to offer a lifetime warranty and make the claim that our acrylic bathroom systems never leak! After we have installed the acrylic walls, all this is left is to install your bathtub or shower fixtures. 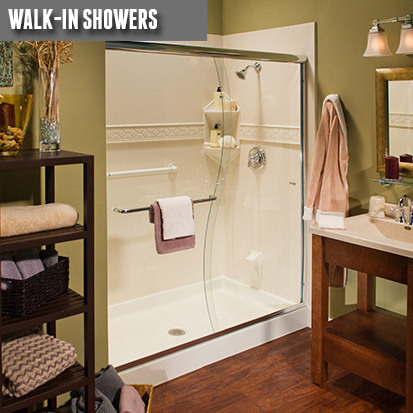 Install any additional options like shower caddies and shower doors. After our installers have finished will all aspects to the acrylic bathroom system, they clean every inch of your bathroom. On average two days is the typical installation period. Then you and your family will be able to enjoy a beautiful new acrylic bathroom system installed by Liberty Home Solutions. For a limited time when you hire Liberty Home Solutions to install a new acrylic bathtub, walk-in shower, bathtub shower combination, safety bathtub or shower you will receive an Instant $1,000 Discount. Because we are not a franchise we do not have franchise fees to pass along to our customers. Allowing us to offer larger discounts on higher quality products. 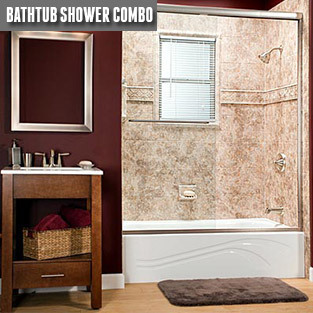 Ensuring you will have the highest quality bathroom remodel shower or bathroom system, for less! To redeem this offer all you need to do is simply call us at 417-889-3218 or fill out the estimate contact form below. At Liberty, we believe in helping you fully understand bathroom remodeling, so even if you have questions, just call us, our time, answers, they are always free!